A note said to have been written by K-pop superstar Jonghyun has been posted on social media by his close friend, revealing a struggle with depression. “The depression that was slowly devouring me at last consumed me,” said the note, posted by fellow singer Nine. Jonghyun, was was 27, was found dead on Monday in a suspected suicide. He was the lead singer of one of South Korea’s biggest pop groups Shinee. His death has triggered an outpouring of grief from fans around the world. On Tuesday, Nine, a member of another pop group Dear Cloud, shared on Instagram the note she said Jonghyun had sent to her, with instructions to make it public if he “disappeared from the world”. Dear Cloud’s management Mymusic Entertainment confirmed to news agency Yonhap the note was posted after consultation with Jonghyun’s family. It spoke about his struggle with living in the public eye, saying “I was broken from the inside” and “the life of fame was never meant for me”. However, no details were given as to when the note was written or sent to Nine. On Twitter, his fans have interpreted the message as the singer’s last request to them. Kim Jonghyun, you did so well. Now you can rest in peace. You’ll be forever be missed. #잘했다 You did well #Jonghyun. 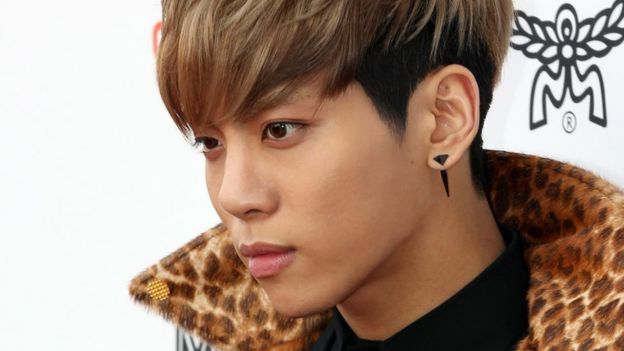 Jonghyun, whose full name was Kim Jong-hyun, was found unconscious in a Seoul apartment. He was taken to hospital where he was declared dead. According to news agency AFP, he had sent several text messages to his sister, including one saying “this is my last farewell”. Police said they would not be conducting a post-mortem examination, following a request from Jonghyun’s family. Officers said it “looks certain” that he had killed himself, but did not officially confirm his cause of death as they were still conducting investigations. The singer was considered by many of his fans to be a very sensitive young man who did not embrace the hedomism that often comes with stardom. As well as being a singer and dancer, he played a large part in songwriting and production for Shinee. He also launched a parallel successful solo career in 2015. The management of Shinee, SM Entertainment, released a statement saying he was “the best artist” and that they were “heartbroken” about his death. 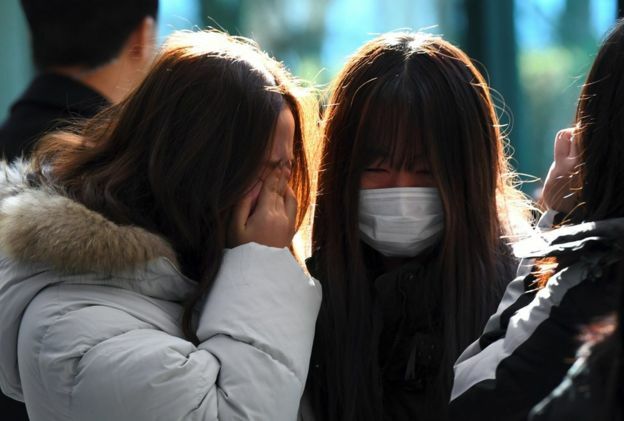 Fans were paying their respects at a funeral hall at the hospital in Seoul throughout Tuesday. 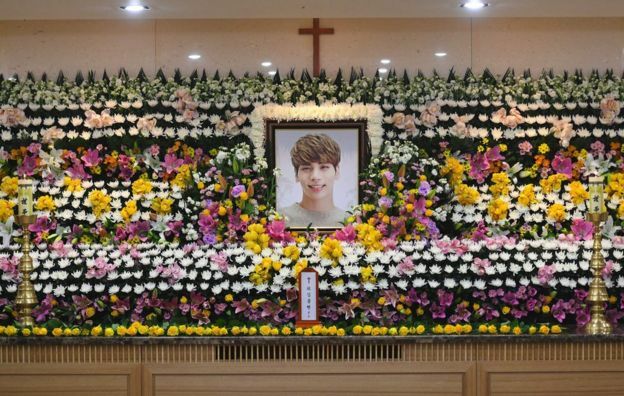 Shinee’s other members were there to receive mourners, who included K-pop stars such as singer BoA and members of girl group Girls Generation, reported newspaper The Korea Herald. A private funeral will be held on Thursday. Shinee were founded in 2008 as a five member group under SM Entertainment, and quickly rose to become of the biggest K-pop boy groups. Conceived in South Korea in the 1990s as a Western-Asian hybrid, K-pop is now a multi-million dollar industry. It is at the forefront of the so-called Korean Wave – the spread of Korean music, drama and film across Asia and worldwide. Over the past years, Shinee recorded several albums in Japanese and in 2017 sold out the 55,000-seat Tokyo Dome and part of their Japan tour. Earlier this year, they also played their first North American tour. If you are feeling emotionally distressed, here are details of organisations in the UK which offer advice and support.